NASCAR is one of more divisive sports out there. Some people just don’t understand it — Isn’t it just a bunch of cars driving around a track in circles? What’s so hard about that? On the other side of the spectrum, some folks treat the sport like a religion; it’s not just driving, it’s a physical grind that involves coordination, guts, and crazy endurance. There is nothing simple about that. The fact is, whether you’re someone who couldn’t care less about a checkered flag or someone who makes sure to tune into as many races as popular, both sides should be able to agree that NASCAR is an incredibly dangerous sport. Every time a racer steps into a car, they are essentially putting their life on the line. Adrenaline, high speeds, risk, these are a part of every race. Unfortunately, sometimes the need for speed and the insatiable desire to win, can get the best of even the most skilled drivers. When that happens, a major wreck is not out of the question. This sport has seen its fair share of wrecks. Yet some of these accidents have stood out among the rest as a reminder of just how dangerous getting into one of these cars can be. 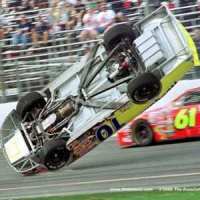 With that in mind, here’s a look at the ten worst wrecks in NASCAR history. This list is unranked. 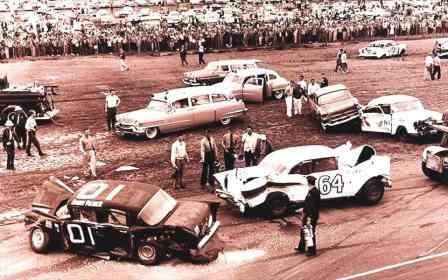 The wreck at the 1960 Daytona Modified Sportsman Race holds firm in the pole position of largest wrecks in NASCAR history. For some reason, 73 cars started on the track that day — on Saturday, February 13th — and it took only one lap for 37 of them to be knocked out of commission. Eight drivers were taken to the hospital that day, but there were no fatalities or life-threatening injuries. While nothing good ever comes from a crash of this magnitude, it at least forced NASCAR to reduce the number of drivers allowed on the track at one time to 43. It’s safe to say, things could have been a whole lot worse.